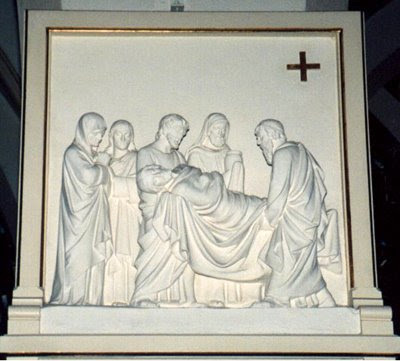 They take the body of Jesus to its resting place. The huge stone over the tomb is the final sign of the permanence of death. In this final act of surrender, who wou ld have imagined this tomb would soon be empty or that Jesus would show himself alive to his disciples, or that they would recognize him in the breaking of bread? Oh, that our hearts might burn within us, as we realize how he had to suffer and die so as to enter into his glory, for us.